Leaks generally rank number one in the list of most common maintenance issues with hydraulic equipment. And leaking hydraulic connections are often accepted as an inherent characteristic of hydraulic machines. While this may have been true 40 years ago, advances in sealing technology and the development of reliable connection systems means that today, leak-free hydraulic systems are very much achievable. Reliable Connections. Ideally, leak-free reliability begins at the design stage, when the type of hydraulic connection is selected for port, tube-end and hose-end connections. Ports – Connectors that incorporate an elastomeric seal such as UN-O-Ring, BSPP and SAE 4-bolt flange offer the highest seal reliability. NPT is the least reliable type of connector for high-pressure hydraulic systems because the thread itself provides a leak path. The threads are deformed when tightened and as a result, any subsequent loosening or tightening of the connection increases the potential for leaks. For these reasons NPT should not be used on high-pressure hydraulic systems. Tube and Hose Ends – Flared connections have gained widespread acceptance due to their simplicity and low cost. The JIC 37-degree flare is probably the world’s most commonly used hydraulic connection. This popularity is due to its ease of fabrication, wide size range, imperial to metric adaptability and ready availability. However, the metal-to-metal seal of the flare means that a permanent, leak-free joint is not always achieved, particularly in the case of tube-end connections. And as hydraulic system operating pressures have steadily increased, the flared connection has become more leak-prone. This results in dirty, sludge-covered systems—see inset. Alternative hydraulic connectors are gaining acceptance, most notably the ‘O-Ring Face Seal’ (ORFS). ORFS tube and hose end connections feature the high seal reliability afforded by an elastomeric seal. However ORFS connectors are larger in size, offer fewer adaptor options, are more difficult to install (alignment must be perfect or O-ring extrusion occurs), and are typically double the cost of a flared connection. For these reasons, ORFS is not currently as widely used as compression fittings and the 37-degree flare. 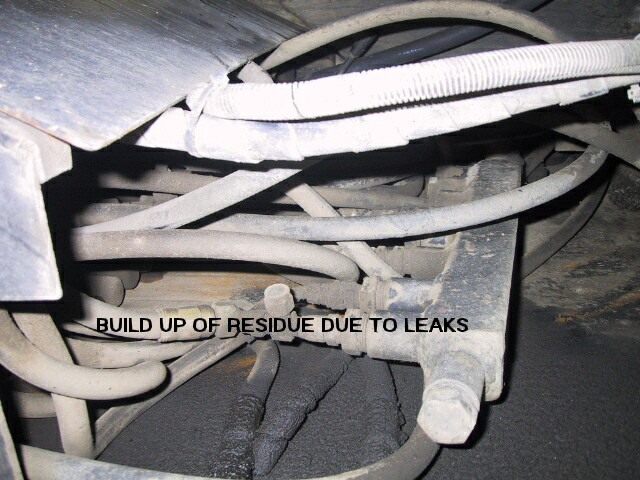 Leaking flare joints can be eliminated by installing a conical washer between the JIC nose and flare. One type of flare seal, manufactured by Flaretite, is a stainless steel stamping, with concentric ribs that contain pre-applied sealant. When tightened, the ribs crush between the two faces of the joint, eliminating any misalignment and surface imperfections—see inset. The combination of the crush on the ribs and the sealant ensure that a leak-free joint is achieved and helps protect the sealing faces from fretting, galling and over-tightening. Vibration can stress conductors, affecting hydraulic connector torque and causing fatigue. Tube is more susceptible than hose. If vibration is excessive, the root cause must be addressed. The propagation of structure-born vibration from the vibrating mass of the hydraulic power unit (the pump and its prime mover) can be minimized through the elimination of bridges between the power unit and tank, and the power unit and valves. This is normally achieved through the use of flexible connections, i.e. rubber mounting blocks and flexible hoses. Having outlined the benefits of hydraulic connectors that incorporate an elastomeric seal, it is important to note that their reliability is dependent on oil temperature being maintained within acceptable limits. Fluid operating temperatures above 82°C damage most seal compounds. So a single over-temperature event of sufficient magnitude can damage all the seals in a hydraulic system, resulting in numerous leaks. Hydraulic systems are often considered perennial consumers of oil and make-up fluid an inherent cost of operating hydraulic equipment. However, a leak-free hydraulic system should be considered the norm for modern hydraulic machines – not the exception. But the proper selection, installation and maintenance of hydraulic conductors and their connections are essential to ensure leak-free reliability. And to discover six other costly mistakes you want to be sure to avoid with your hydraulic equipment, get “Six Costly Mistakes Most Hydraulics Users Make… And How You Can Avoid Them!” available for FREE download here. Brendan, Well written article. Just to add to your 37 degree fittings comments above, Several years ago I installed 200 + feet of 5/8″ x 0.083 wall SS tubing with 37 degree flare. When starting the job up There were 6-10 leaking fittings at my flared joints. I then went back to my supplier of the SS tubing and sure enough some of the tubing came from China and the flared area seemed to fret as the material was inferior and not made to proper standards. Fortunately, I was aware of Flaretight and after installation on all the leaks were gone!